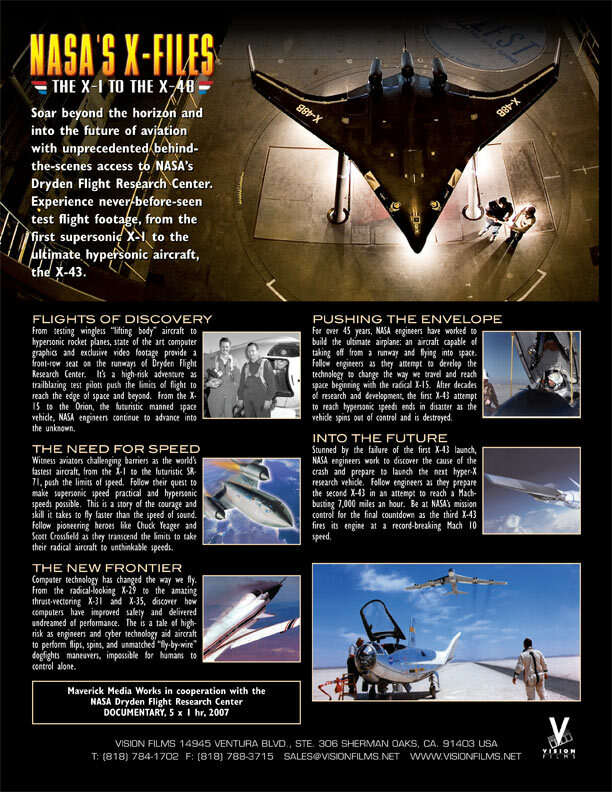 FLIGHTS OF DISCOVERY From testing wingless lifting body aircraft to hypersonic rocket planes, state of the art computer graphics and exclusive video footage provide a front-row seat on the runways of Dryden Flight Research Center. It's a high-risk adventure as trailblazing test pilots push the limits of flight to reach the edge of space and beyond. From the X-15 to the Orion, the futuristic manned space vehicle, NASA engineers continue to advance into the unknown. THE NEED FOR SPEED Witness aviators challenging barriers as the world's fastest aircraft, from the X-1 to the futuristic SR-71, push the limits of speed. Follow their quest to make supersonic speed practical and hypersonic speeds possible. This is a story of the courage and skill it takes to fly faster than the speed of sound. Follow pioneering heroes like Chuck Yeager and Scott Crossfield as they transcend the limits to take their radical aircraft to unthinkable speeds. THE NEW FRONTIER Computer technology has changed the way we fly. From the radical-looking X-29 to the amazing thrust-vectoring X-31 and F-23, discover how computers have improved safety and delivered undreamed of performance. The is a tale of high-risk as engineers and cyber technology aid aircraft to perform flips, spins, and unmatched ãfly-by-wireä dogfights maneuvers, impossible for humans to control alone. PUSHING THE ENVELOPE For over 45 years, NASA engineers have worked to build the ultimate airplane: an aircraft capable of taking off from a runway and flying into space. 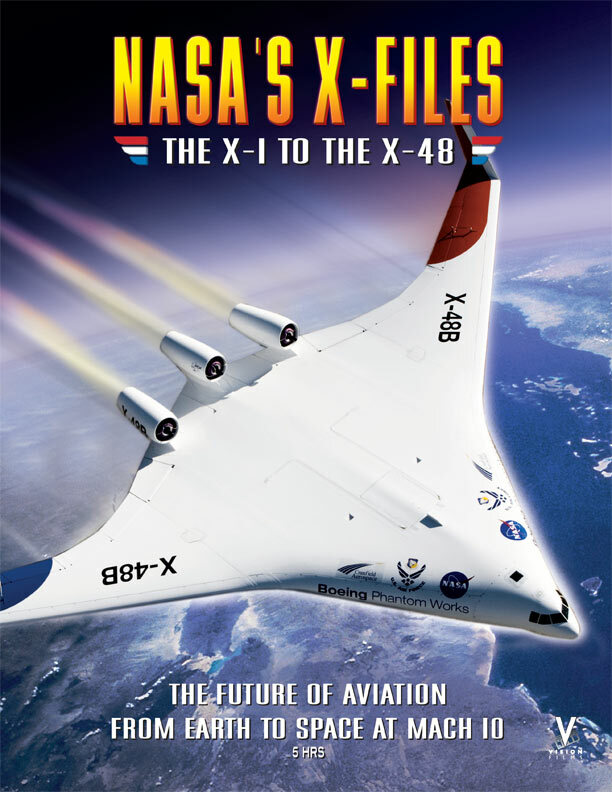 Follow engineers as they attempt to develop the technology to change the way we travel and reach space with the radical X-43. After decades of research and development, the first X-43 attempt to reach hypersonic speeds ends in disaster as the vehicle spins out of control and is destroyed. PUSHING THE ENVELOPE INTO THE FUTURE Stunned by the failure of the first X-43 launch, NASA engineers work to discover the cause of the crash and prepare to launch the next hyper-X research vehicle. Follow engineers as they prepare the second X-43 in an attempt to reach a Mach-busting 7,000 miles an hour. Be at NASA's mission control for the final countdown as the third X-43 fires its engine at a record-breaking Mach 10 speed. Soar beyond the horizon and into the future of aviation from Earth to space at MACH 10 with unprecedented behind the scenes access to NASA's Dryden Flight Research Center. Experience never-before-seen test flight footage and air travel at unimaginable speeds, from the first supersonic X-1 flight to plans to create the ultimate hypersonic aircraft, the X-48.